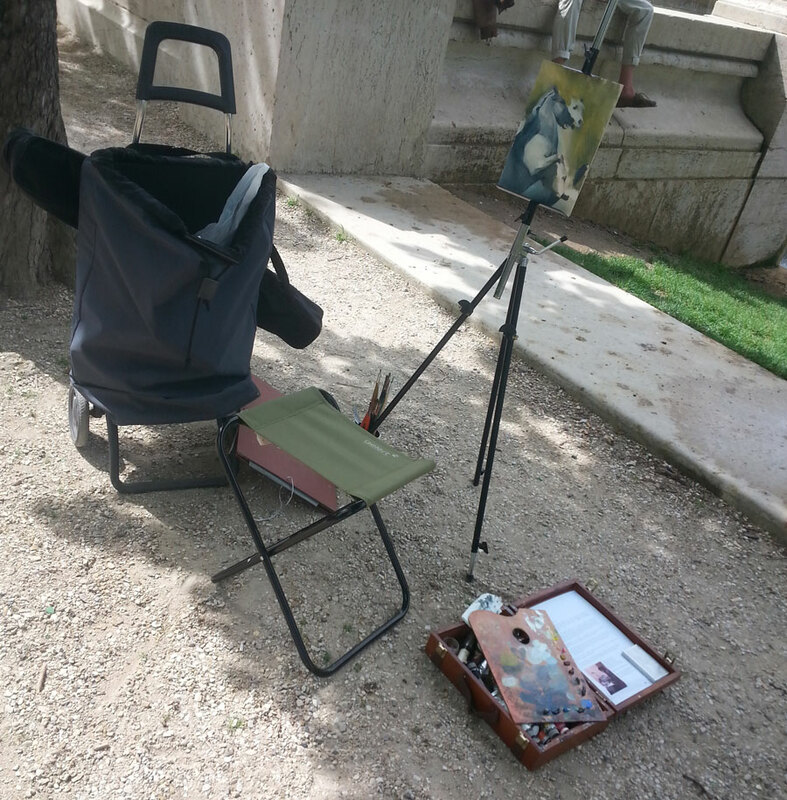 Recently I’ve made a few excursions painting in Paris. Although it’s been steep learning curve in both painting and logistics, I’ve concluded that it is a painter’s paradise; balmy weather, beautiful subjects, well-shaded streets, squares and gardens as well as plenty of public toilets. Planning painting expeditions in advance allows me to make the most of my painting time by minimising faffing around and avoiding unnecessary inconveniences or lack of ‘conveniences’. WHEN are you going to paint? Do you want morning, afternoon or evening light? Is there a more specific time period to the light effect you want to paint? It’s really tempting to keep working after the light has changed significantly but I’ve found it counterproductive as it invariably takes the painting away from its original concept. Perhaps more experienced painters are able to hold on to their original vision but I’m not able to do that yet. So, I opt for either finishing the session and moving to my next subject, or, if the new condition is better for changing the concept. This needs a little caution though, as it’s easy to accidentally overlook some areas and end up with inconsistent lighting. The more you can narrow it down the better. It is far easier to explore without your painting kit in tow. WHAT are you planning to paint when you get there? Which parts or views interest you? In my earliest painting excursions I found it all too easy to be overwhelmed by the wealth of wonderful subjects. Just deciding what to paint was a challenge that took up far too much of my painting time. Now I try to visit beforehand so I know exactly which view of the subject I want and where I am going to set up. WHY are you painting that? What’s the concept for the painting? Do you have a clear vision of what you are trying to achieve? 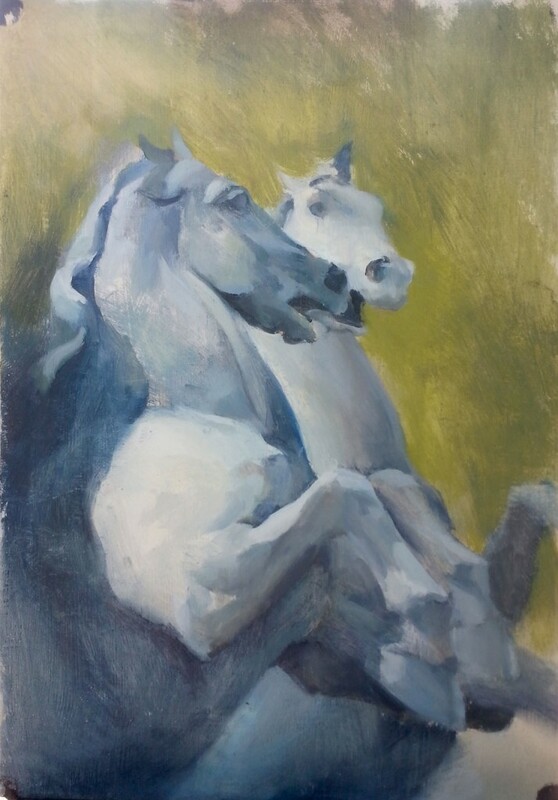 I have a tendency to revert to atelier study mode; for me this is too slow for a short study and lacks the selective focus that I am looking for in plein-aire work. Having a clear idea of what I want allows me to be much more selective in what I paint and how I paint it, editing out extraneous detail so that what I do paint best serves the painting. HOW are you going to get there with your painting equipment? In Paris this is incredibly easy as most places are within a few minutes walk of public transport. However most metro and RER stations do not have step free access so make sure you can carry your kit for short distances if necessary. And last but not least; a way to carry wet paintings. There are many systems of carriers and boxes for this, most of which are large, heavy or expensive. The best solution I’ve found so far uses small metal clips, one at each corner of the painting and masking tape, to fix them together. In this way 2 or more boards of the same size can easily be carried. The unexpected will always occur. Things will blow away, sudden rainstorms will sneak up on you, you will spill things, passing footballs will reorganise your palette….I am certain that there will be many more mis-adventures, perhaps best shared over a glass of wine with painting friends. If you’re planning a painting trip to Paris please get in touch, I’ll be happy to help.